This post was first published by Derby born Penarth resident blogger, Indymam, arguing why she believes Wales deserves independence. I was born and raised in Derbyshire – the brooding moors of the Dark Peak still stir my soul. Much of my family live in England and are one part of a deep connection for me with Wales’ neighbour that will never break or wane. Wales is my home. I moved here for love, and now after a little over ten years I am in love not only with a Welshman and our three inspiring children but also with this Nation, Cymru. I love our culture, our language, our landscape, our heritage and our history of socialism and equality. Since June the 24th I have been campaigning for Welsh Independence. In the throes of shock and grief after the Brexit vote (in Wales of all places) something changed in me. I knew that the time for talking politics had passed, and that the only appropriate response was to get up and do something. I have been a member of Plaid Cymru for almost as long as I have lived in Wales (I compared all the party manifestos when I arrived, and consistently since then Plaid Cymru best represents my views). Until now it hadn’t been about independence for me (and still isn’t just for its own sake). Plaid Cymru also best represent my views on the environment, nuclear disarmament, gender equality, anti-austerity and much more. But now I see that indpendence for Wales is a must. As my world tore asunder after that vote – I realised once and for all that I am done with Westminster politics and politicians. It is time for Wales to make its own decisions, and we will make much better ones on our own behalf. Sustainable, just and fair decisions. In the interest of all the people of Wales, not just a small elite, and treading lightly on our fragile lands, without impacting on the well being of poorer nations. I decided to choose hope over grief. Amidst the crazy mess we’ve made with this vote I saw a huge, bright opportunity and I realised that almost nothing will ever be the same in Wales or the rest of the UK again. I don’t blame people who voted ‘leave’. I want to understand. I do blame a lot of people (the media in Wales for lack of decent debate about the implications for Wales, politicians here who treated it as ‘not our argument’, for a start). I badly wanted to be Scottish when I watched and wept at Nicola Sturgeon’s speech reaching out to immigrants in Scotland and showing the kind of leadership we so badly need here in Wales. But I steeled myself because I believe in Leanne Wood and know that she can be the leader we deserve. On the 25th of June, 48 hours after the result, I advertised a pop-up rally for independence in Cardiff for the following Saturday. This was somewhat of a leap of faith, and I wasn’t entirely sure where I would begin in making such a thing happen – so I just put it out there before I had chance to change my mind. Commit. I’d like to thank all the people who collaborated with me that week, and especially to those who, when I initially said ‘I’m not sure I’m the person do this’, said, essentially ‘if not you then who?’ They were right. Every single one of us has a role to play. With my new view on the world, awoken it feels, as if from a long but unsatisfying slumber, I see that I can no longer justify thinking ‘but it’s up to them to sort out all of this mess, not me.. politicians, people with more time on their hands, people who don’t have a small children to look after, Plaid people’. I am Plaid too. I should influence, not sit on the sidelines. I am campaigning for Welsh independence because I believe in a better Wales. I think that politics in the UK is broken, but we don’t have to put up with that. I don’t want to just sit here and despair as first-past-the-post politics delivers us more of the same, ever more right wing elitist politics. The endless march of old Etonians and the revolving door between Government and the board rooms of the Footsie 100 are not good enough, we deserve better. I don’t want the House of Lords. I don’t want to spend billions on Trident. I don’t want to be a part of future military interventionism such as the war we waged in Iraq. We can and should do things differently in Wales, and I believe that we will. I want to live in the Wales we could be, not put up with being kept in our place. We have the potential to be at the cutting edge of the green economy for instance, but Westminster, including our own politicians in Wales, repeatedly deny us control over our own resources (all Welsh Labour MPs recently abstained or voted against amendments to the Wales Bill that would have devolved powers over water, energy and policing to Wales, although you might have missed it as the Welsh media were largely silent). We once led the industrial revolution on account of our coal (but the profits mysteriously seeped over the border) now we can be a world leader again by showing how a clean green economy is possible. Many ask whether we have all the answers yet in the independence movement, especially on the economy. One of the reasons I want to be involved is that I’m not sure that we are asking the right questions. I believe we have the opportunity to set the agenda, frame the debate. Lets make this about more than just GDP. What about a country that measured its success on Gross Domestic Happiness? What about well being as a measure of success? As a self determining Nation, designed for the well being of all its citizens and the environment, we could be a beacon for the rest of the world. First and foremost we need to believe in ourselves. I don’t buy into this theory about Wales not having what it takes to be independent. I’m not sure where it comes from, or when it started, but it lacks evidence and deserves to be challenged (though people will tell you the converse is true). It is also a very detrimental and limiting dogma to subscribe to. Twenty two other European countries with a smaller population than us can do it. I’ve yet to hear a credible argument why we can’t. There seems to be a myth in Wales that we just aren’t good enough. We are. Some people refer to lack of leadership and claim that politicians in Wales aren’t up to the task. This is not something inevitable about Wales – if our elected representatives aren’t up to scratch we should elect different ones. Finally, I need to get involved because this movement needs women. Its essential that the voices of women are heard, to help shape a well-rounded debate. As a feminist, as a mother, as someone who wants to see better representation of women at all levels of Welsh civic society, I want to do my bit. I can’t advocate for others to do what I’m not willing to do myself. So I’m putting myself forward for the 2017 local government and Town Council elections. I stood in 2012 just to make up the numbers (I wanted everyone in the town where I live to have the option to vote Plaid, so I put my name forward in a ward that otherwise would have been unrepresented) but I didn’t campaign, for various reasons it wasn’t the right time. Now it is. 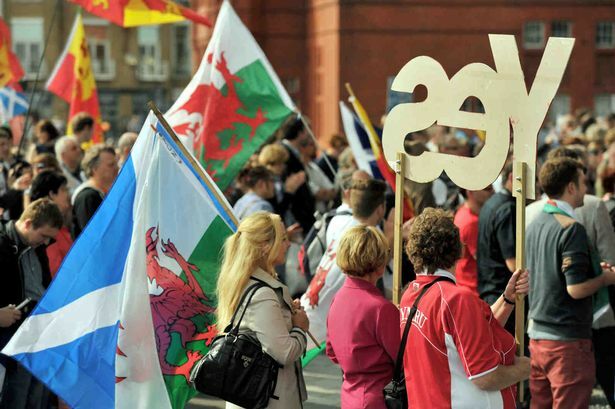 We touched on many emotive issues, not least the need for the independence movement in Wales to be one that resonates in the medium of English just as much as the Welsh language… a subject for another time. I came away feeling inspired, amongst other things to begin this blog. We spoke of the importance of testimonials and sharing stories, for people to relate how they came to be part of the independence movement, what it means to them and the key moments that changed their perception. So this is part of my story, of how I came to be here, campaigning for Welsh independence. Welcome to the #indywales movement Bella Gwalia! Delighted to have you on board! We desperately need places to draw together indy writing so an ‘umbrella blog’ for the movement is fantastic. We had a yescaerdydd meeting yesterday and I mentioned you had started this, everyone was delighted! Thanks for reposting this blog, it feels like forever ago now, so much has happened since. Will you be setting up a Bella Gwalia twitter feed?